RAISE UR PAW NEWS: Have You Heard of "WEAR A COLLAR DAY?" 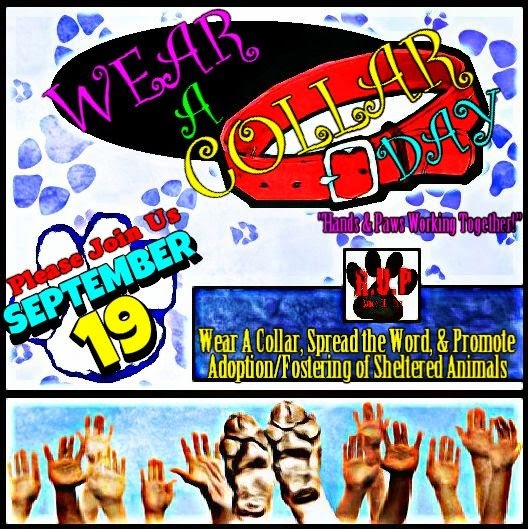 Wearing A Collar On September 19th Gets People To Spread the Word on Adoption/Fostering Sheltered Animals! It might sound like a strange idea, but many are already becoming involved in putting on a collar in hopes of spreading the word and being part of helping bring to light adoption/fostering of sheltered animals worldwide -- and we at RAISE UR PAW are hoping that it will not only hit the social media circuit, but also open countless eyes and hearts to help innocent lives that are in need of special people/families to give them the happy & loving life that they deserve. WEAR A COLLAR DAY involves bringing humanity together and strapping on a collar and sharing with the world the message that so many lives are in need of families - millions of pets that are waiting within the walls of shelters or on death row for someone with a kind heart & soul and give them that second chance at happiness that they deserve. People can either take a selfie with hashtag #WearACollarDay and share it on social media, getting others involved by challenging them as well to do the same or make a contribution to any local animal shelter etc of their choice. Since September 19th will be the 1st year death anniversary of my beloved little girl PJ, I wanted to do something to not only honor her memory but to also help those find that unconditional love and compassion that my little girl had given me for the past 13 years - a special bond & link that many of these sheltered animals can give to those people who are in need of that special "furever friend" that they can bring into their lives and homes and call them family. 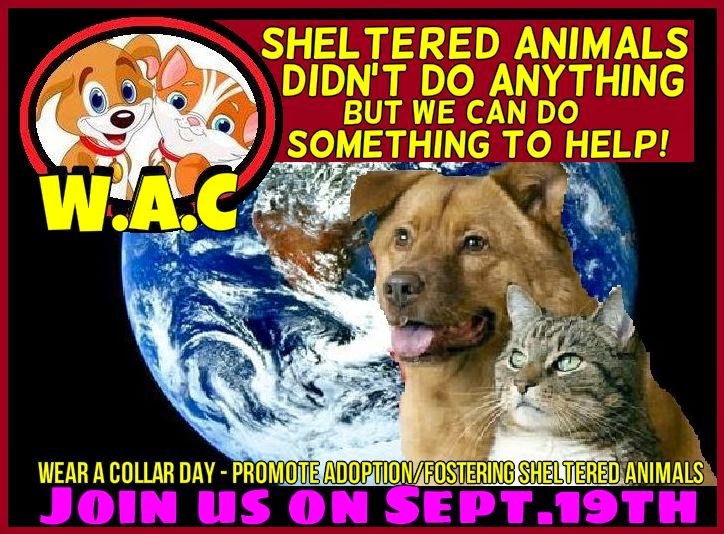 We are hoping this campaign in which uses the hashtag #WearACollarDay, will not only attract many to become involved in this creative way to promote the adoption/fostering of sheltered animals via social media and communities nationwide - but to also bring out animal angels to save the countless lives that are depending on our voices to speak out for them, and our loving arms and homes to forever protect them and be there for them forever. Please Take A Moment of Your Time to Play a Part in Saving Lives in Need ---> Share the message worldwide and let's RAISE OUR PAWS TOGETHER as a unity to - REMEMBER "Helping One Sheltered Animal May Not Change the World, But To That One Sheltered Animal Their World Will Change Forever!"